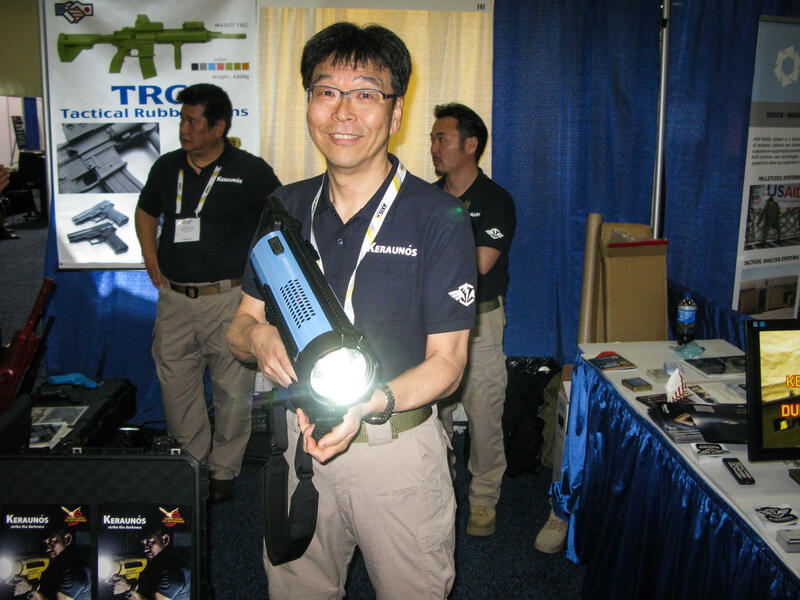 Hiro Yazawa of Japan Cell displays a spotlight weapon that sells for $5,000 at the Border Security Expo in San Antonio on Tuesday. Mike Pine and Denise Germann of CT Defense at the expo with a $750,000 mobile command post they hope to sell to the U.S. Border Patrol. There's a lot of excitement at the Border Security Expo in San Antonio, where vendors schmooze with government buyers and peddle their wares. This year, the White House is asking Congress for billions of dollars for border security, and it could include thousands of new federal agents, many miles of a formidable wall and the latest surveillance and reconnaissance technology. And the vendors here in the exhibition hall at the Henry B. Gonzalez Convention Center are ready. The Homeland Security Department is already the largest federal law enforcement agency with the biggest budget, and it may get even bigger. With that in mind, booths here are packed with cameras mounted on telescoping poles, facial recognition and biometric software, vehicle scanners, license plate readers and lots of drones. Unmanned Systems and Solutions, in Hinsdale, Ill., sells heavy-lift (up to 30 pounds) unmanned aerial vehicles that get their power from a tethered cord instead of in-flight batteries. "We had plans to come to the expo before the presidential election, but we definitely came when this administration came into office," says Pete Dwyer, a partner in the company. At the expo, merchants are showing off rubber guns, real guns and a peculiar, sci-fi-looking spotlight gun. "It's for border control, for searching for people, and ... also for blinding eyes," says Hiro Yazawa, representing the Tokyo-based manufacturer, Japan Cell. The spotlight weapon — priced at $5,000 — has had a hard time finding U.S. customers, though Yazawa says the Japanese military uses them. The largest item is a mammoth, $750,000, camo-colored truck and trailer that sleeps 33; it's for deployment in remote areas. Mike Pine of CT Defense says he wants to sell the trucks to the Border Patrol. Trump's focus on Southwest border defense got his attention and this is his first time at the expo. "We've got another 5,000 [Border Patrol] agents that are coming on board," Pine says. "The question is how will they deploy these agents to the front lines? ... Today, the agency is using trailers and shipping containers." For a reality check, there are certainly "bad hombres" crossing illegally into the country, as the president claims. But most unauthorized immigrants are men looking for work in jobs like landscaping crews or Central American mothers with small children in tow seeking asylum. Nevertheless, the booths at the expo bristle with military-style tactical gear. "We hope a bad guy shoots one of our remote-controlled mounted cameras instead of an agent," says Dennis Smith, of AgileMesh Inc.
One of those looking to buy is Gabe Acosta, assistant chief patrol agent in Laredo, Texas. He is looking for new, high-tech law enforcement gear, and he says so far his favorite "is a certain night vision optic, which allows you to see color at night, versus your standard green screen." Walking around the exhibit hall, you realize this is not a conference for wall builders. In fact, Trump's "big, beautiful wall" is not especially popular at the expo. Jay Ahern, former acting customs commissioner, called it "dumb physical infrastructure" during his panel at the gathering. "While the wall gets a lot of play publicly," Ahern said, "I think the technology piece will be critically important." Far from San Antonio, dozens of contractors are designing prototypes of a border wall, ranging from 18 to 30 feet high, that must withstand sledgehammers and blowtorches. But here at the expo, current and former Homeland Security officials are looking for a smart border that may depend more on computer screens than on steel and concrete. There's a whole lot of excitement at this year's Border Security Expo in San Antonio. Here's why - the White House is asking Congress for billions of dollars to fund more federal agents and many miles of a border wall. That could mean big opportunity for the vendors who are peddling their wares to government buyers. NPR's John Burnett has this report. JOHN BURNETT, BYLINE: The Homeland Security Department is already the largest federal law enforcement agency with the biggest budget, and it may get even bigger. With that in mind, the exhibition hall at the Border Security Expo is packed with vendors, most of them selling the latest high-tech gadgetry for surveillance and reconnaissance. MARK TINKER: My name's Mark Tinker. I'm the CEO of Quantum Technology Sciences, and we sell unattended seismic acoustic sensors. ANDREW FINN: My name is Andrew Finn. I'm with Fraser Optics. Our core competency is handheld gyro-stabilized binoculars. MIKE PINE: Mike Pine, vice president of business development for CT Defense. And we are here today to promote a mobile command post that's capable of housing up to 33 agents for 20 days off the grid. BURNETT: So this is like a giant cammo RV. BURNETT: So you figure because there's a boom in border security under this president, it's good time to be at this expo. PINE: Absolutely. We've got another 5,000 agents that are coming on board. The question is how well the Border Patrol deploy these agents to the front lines. BURNETT: For a reality check, there are certainly bad hombres on the border. But most immigrants who cross illegally are men looking for work in a landscaping crew or Central American mothers with children in tow, asking for asylum. Nevertheless, the vendors at the Border Security Expo are loaded for bear. Their booths bristle with military-style tactical gear, the latest police assault weapons, surveillance drones and a strange sci-fi-looking spotlight that you aim like a rifle. It's offered by a Japanese company whose spokesman is Hiro Yazawa. And what would this do? BURNETT: It could temporarily blind them. GABE ACOSTA: Is a certain night vision optic, which allows you to see color at night versus your standard, you know, green type of screen that you may have. It's like day shift at night. BURNETT: Walking around the exhibit hall, you realize this is not a conference for wall builders. In fact, Trump's big beautiful wall is not especially popular at the Border Security Expo. Jay Ahern, former acting customs commissioner, called it, quote, "dumb, physical infrastructure" during his panel at the expo. JAY AHERN: While the wall gets a lot of play publicly, I think the technology piece will be critically important. BURNETT: Far from San Antonio, dozens of contractors are designing prototypes of a border wall, ranging from 18 to 30 feet high. But here at the Security Expo, current and former Homeland Security officials are looking for a smart border that may depend more on computer screens than steel and concrete. John Burnett, NPR News, San Antonio. Transcript provided by NPR, Copyright NPR.